Richard Lynn "Rick" Scott (born December 1, 1952) is an American politician and businessman. He is the junior United States Senator of Florida since January 8, 2019. 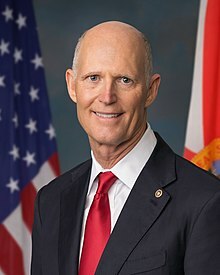 He was the 45th Governor of Florida from 2011 to 2019. He is a member of the Republican Party. In April 2018, Scott announced his plans to run for the United States Senate against current Senator Bill Nelson. In August 2018, Scott won the Republican nomination and soon won the general election. ↑ "Summary of Information on Rick Scott". Thepoliticalguide.com. Retrieved 2011-05-30. ↑ "Oh, if only Florida had a governor who liked business people". Blogs.orlandosentinel.com. Retrieved 2011-05-30. ↑ "Republican Rick Scott wins Florida Senate race, defeating incumbent Bill Nelson". Vox. Retrieved November 6, 2018. ↑ Dixon, Matt; Caputo, Marc (April 9, 2018). "Scott running for Senate in epic showdown with Nelson". Politico. Retrieved April 9, 2018. This page was last changed on 3 March 2019, at 20:52.